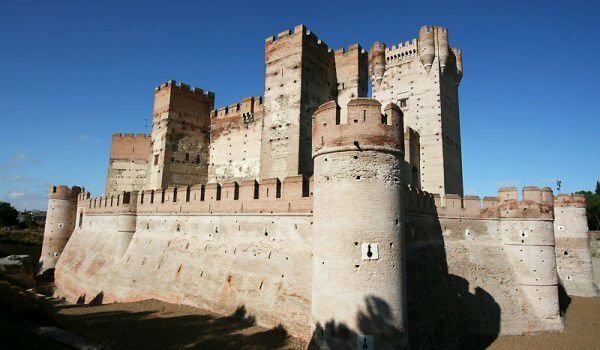 Mota Castle was locally known as Castillo de la Mota and is located in Medina del Campo, in the province of Valladolid in Spain. This fortress is one of the most dreaded throughout Spain and reflects the wealth and prestige of the town. Once there were trade fairs in spring and autumn, which formed Medina del Campo as a major commercial center. The fair was rich with traders from around the world including, Africa, Italy and France, which offered various goods such as woolly wool, agricultural products, books, art and much more. The fortress Mota was probably built in the 12th century and served as the villa of a wealthy Muslim merchant. Previously, the site of the present palace Mota had an earlier structure, probably built by the Moors. In the 13th and 14th century the castle continued the strengthening of Mota. As it is kept to this day, was constructed during the 15th century. In 1440 Juan II, was king of Castile and head of the Fonseca family ordered the reconstruction of a rannito Muslim stronghold. The draft of the new castle Mota was the architect of Alonso Nino, which cooperated with Fernando Carreno. The impressive fort in their design stood at a grand height of 40 m.
Later in the 15th century, Isabel, who was one of the Catholic monarchs, ordered the construction of the external walls of Mota, and commissioned the design and erection of two of their Arab masters. In the 16th century, fortress Mota served as a prison. In the 17th century, Mota castle sank in ruins, and shortly afterwards was restored to be abandoned and neglected for a second time. In the early 20th century the Mota castle was in a miserable condition, the walls were crumbling, roofs were falling and its interior was empty. Thanks to General Franco's castle it was restored and turned into a female institute. Today, beyond the massive walls of the castle Mota cultural activities are held.